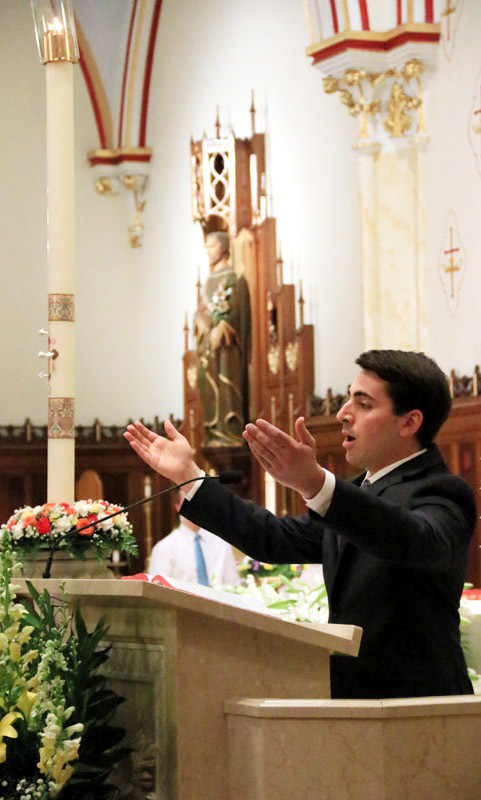 Matt Rinaldi leads the congregation in song. 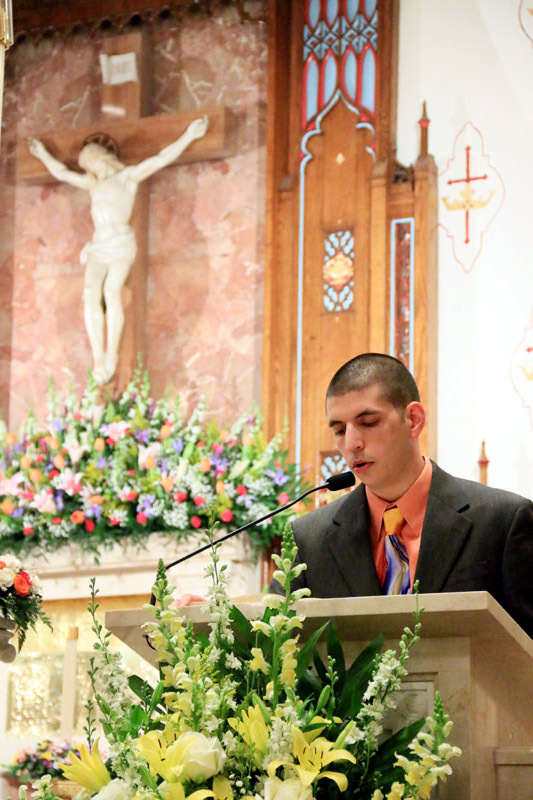 Lector Chris Maddox proclaims a reading from Scripture. 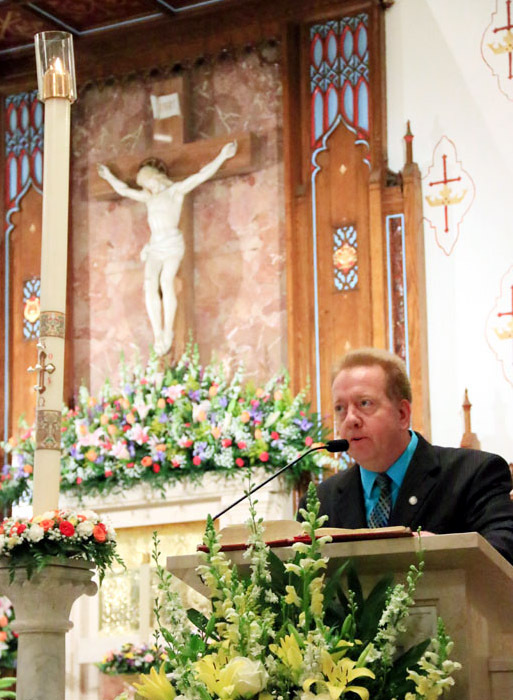 Lector Steve Bochanski proclaims a reading during Mass. 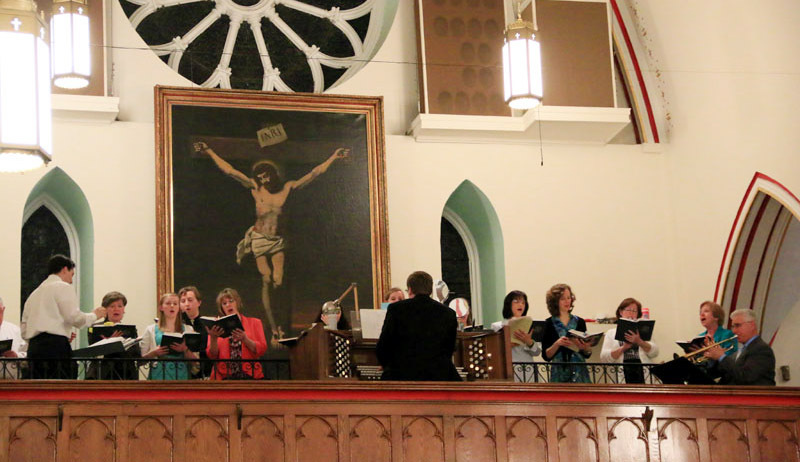 The choir and musicians of St. Charles Parish lead the congregation in song. 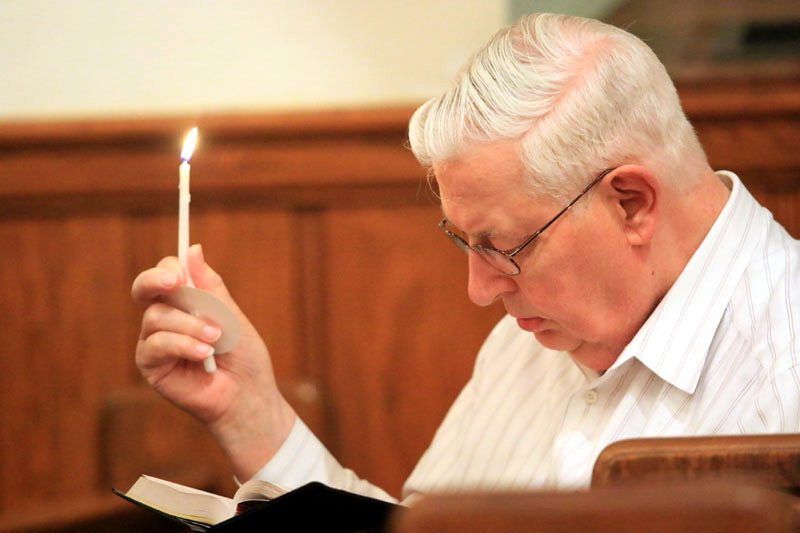 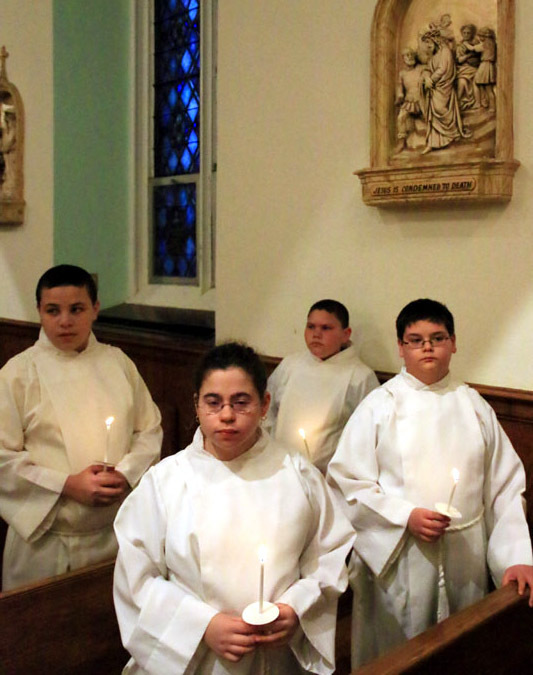 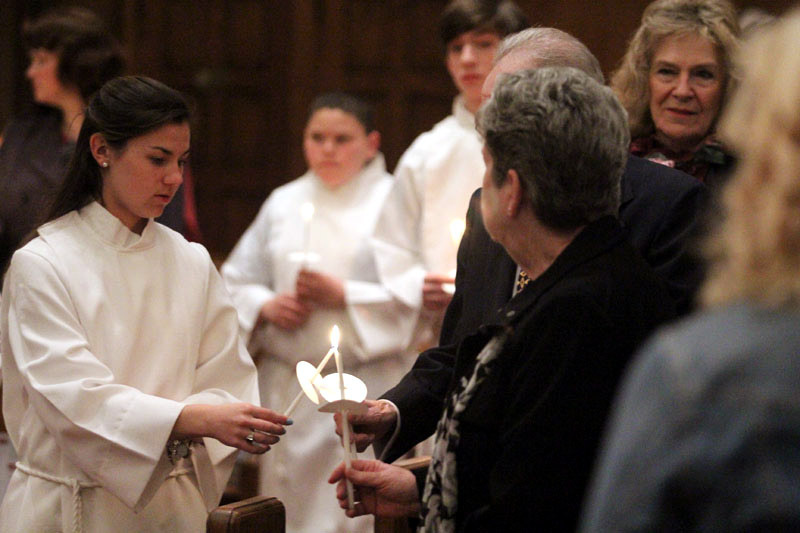 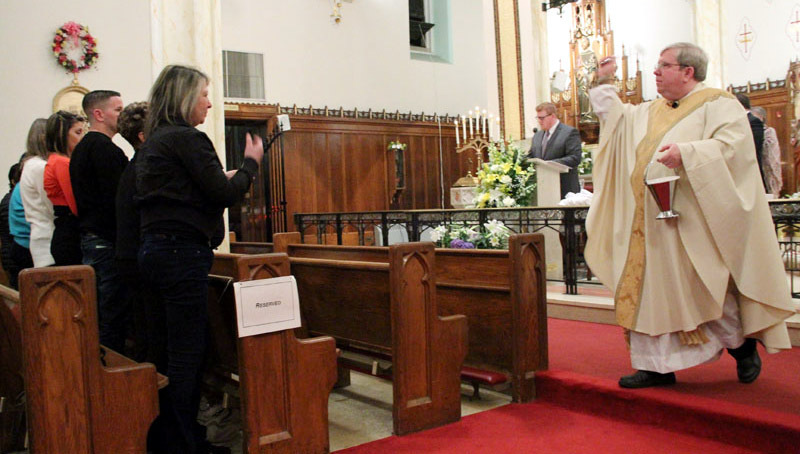 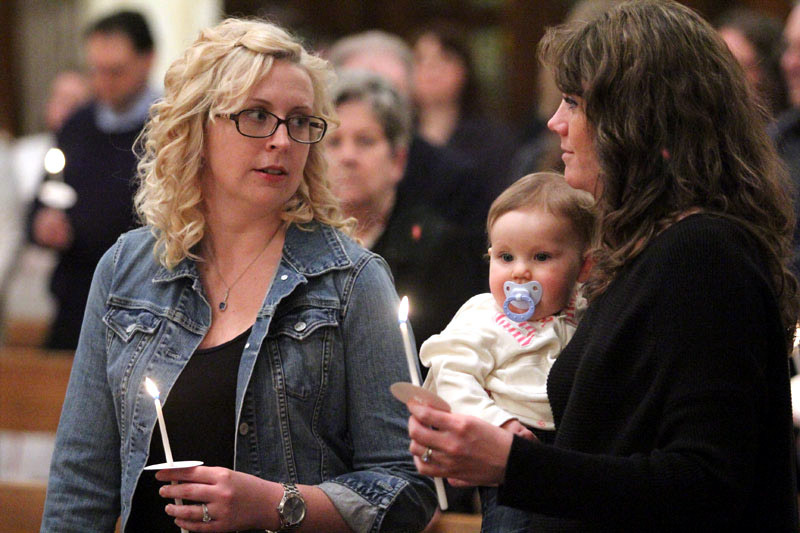 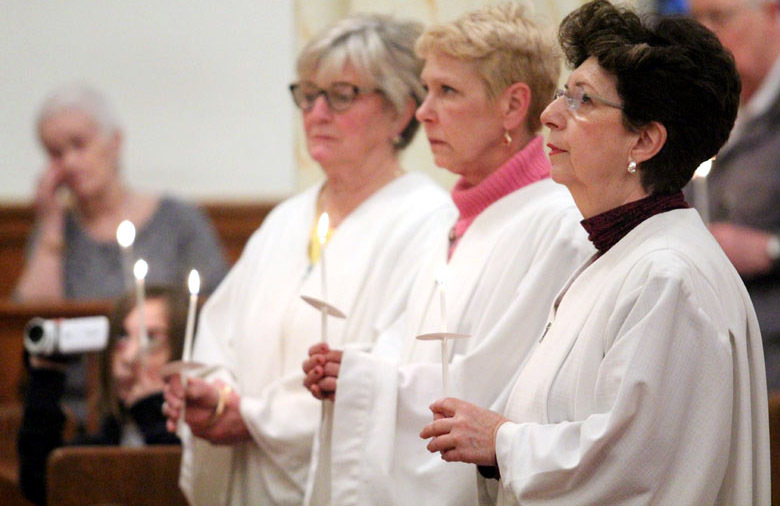 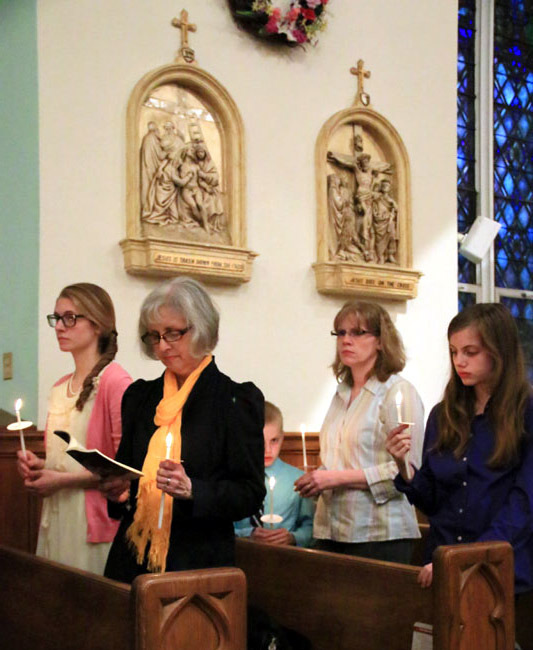 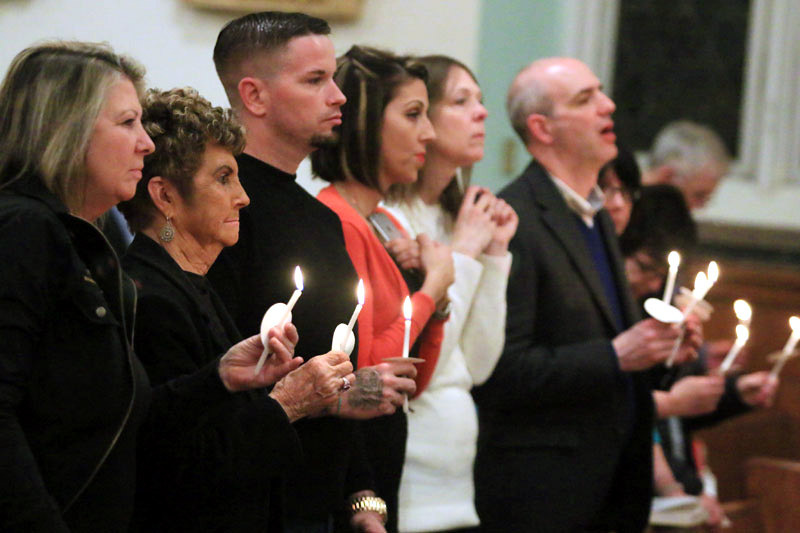 A parishioner holds a candle and follows the readings during the Service of Light in the first part of the Easter Vigil liturgy. 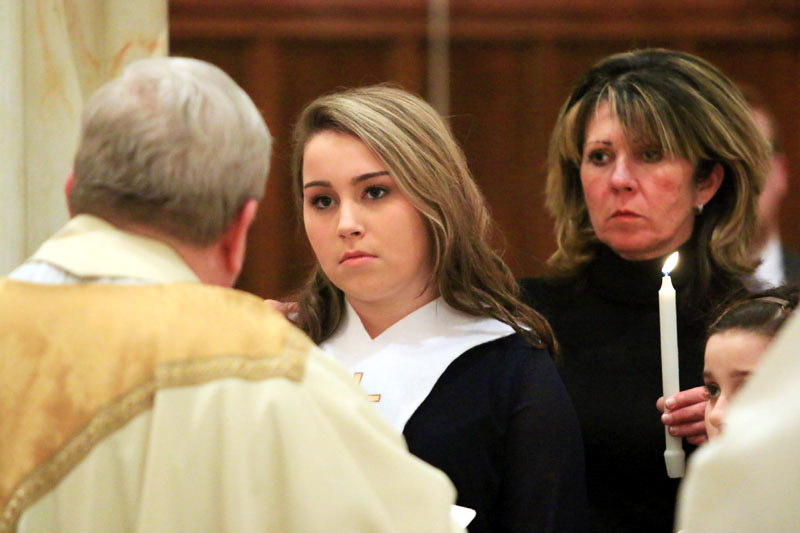 Alexis Devlin (left) and her baptismal sponsor Doreen Smyth. 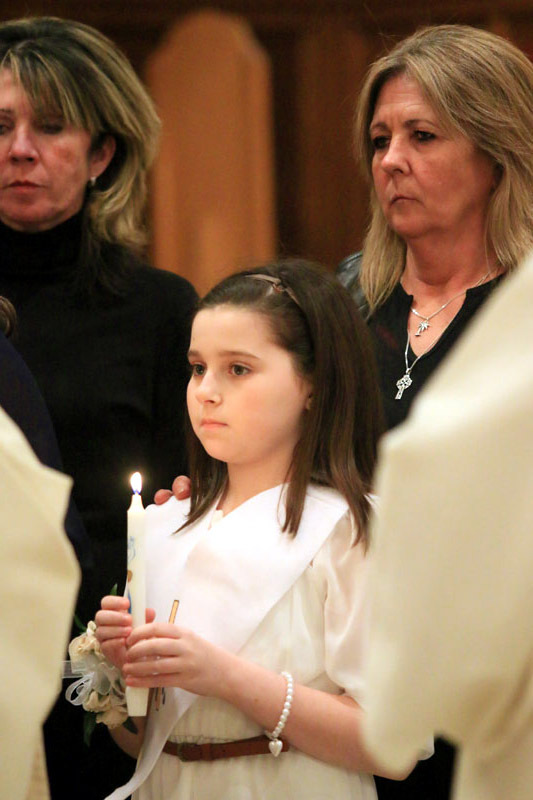 Julianna Devlin (center) prepares for baptism. 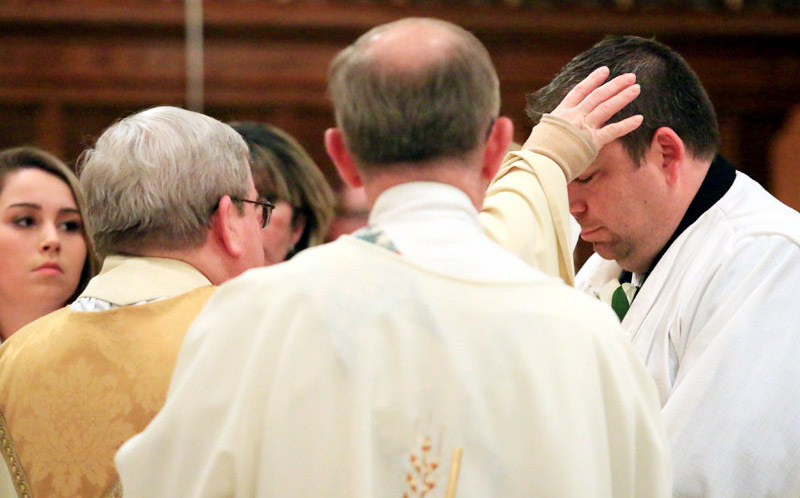 Father James Lyons anoints the head of Jared Zangwill. 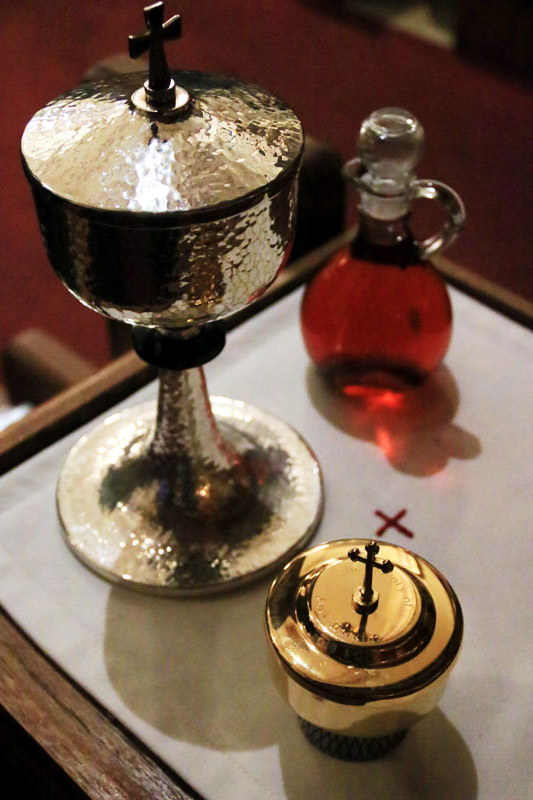 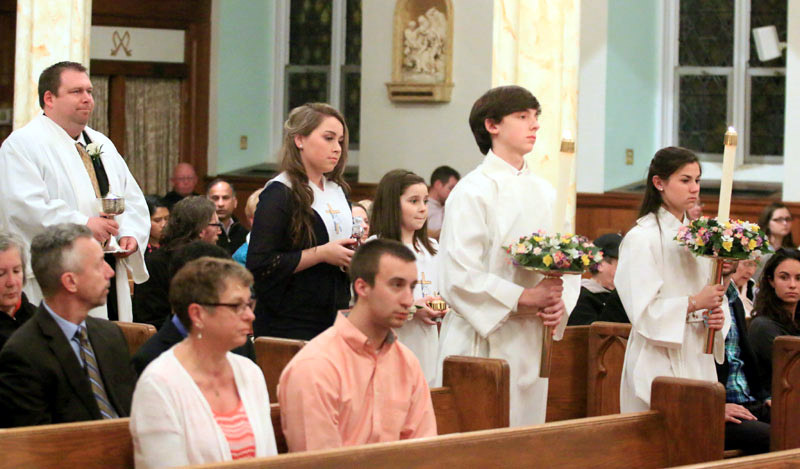 Newly baptized Jared Zangwill, Alexis Devlin and Julianna Devlin bring up the offertory gifts. 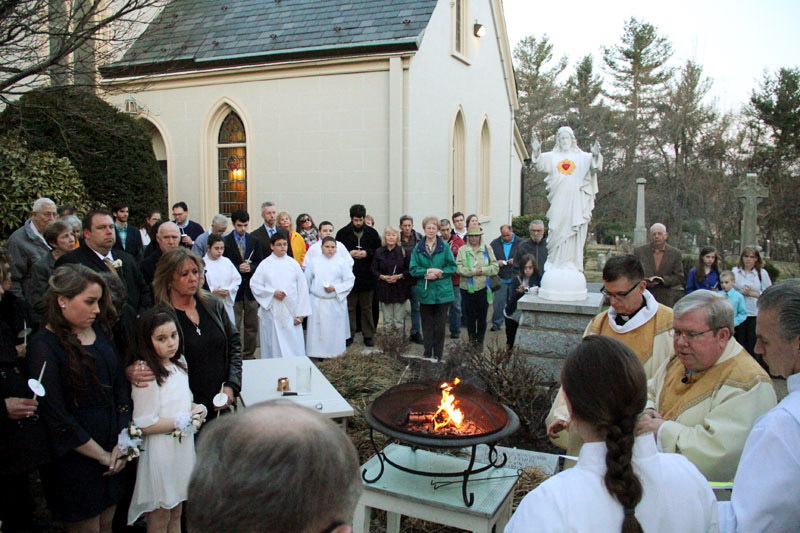 Mass starts in the courtyard of St. Charles Borromeo Church with the lighting of the paschal candle from the new Easter fire by Father James Lyons, pastor. 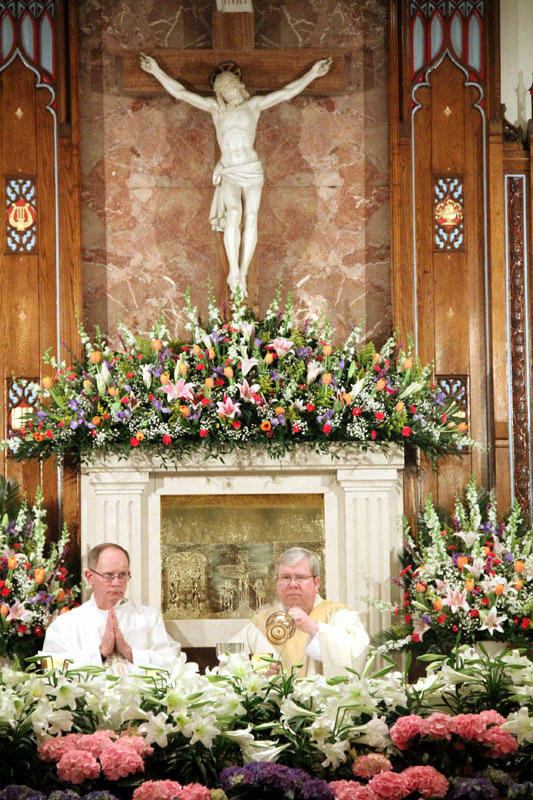 Beside him is Jesuit Father Richard McGowan from Boston College, who is a son of the parish. 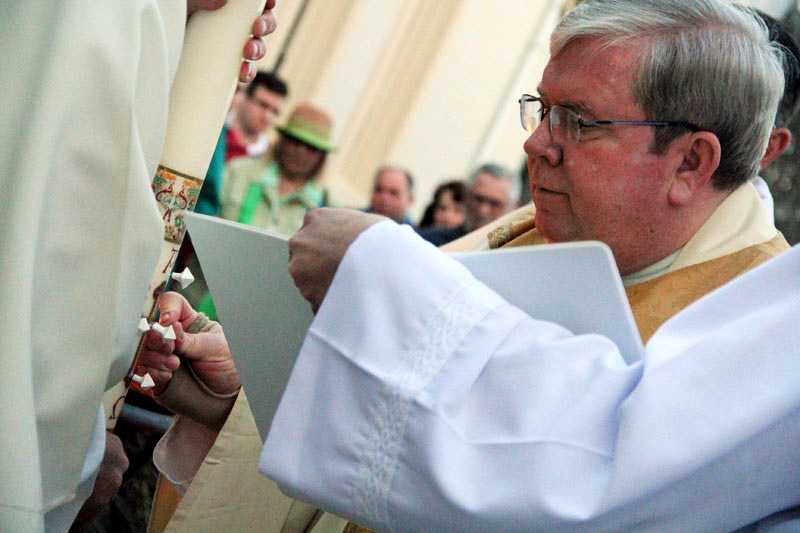 Father Lyons inscribes the paschal candle according to the ancient rite for the liturgy. 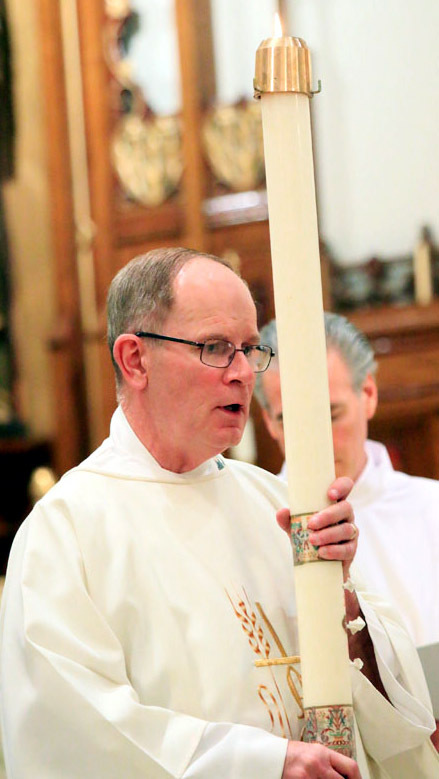 Deacon John Farrell holds the paschal candle as the people pray the prayer proclaimed by Father Lyons. 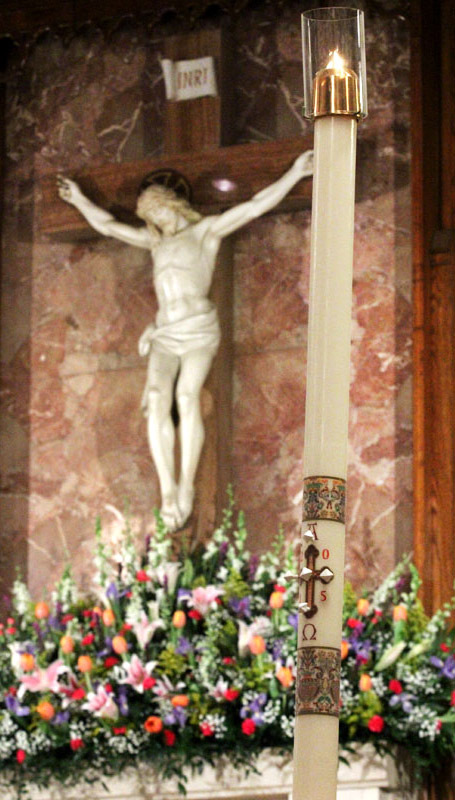 Father Lyons puts pins in the shape of the cross in the candle. 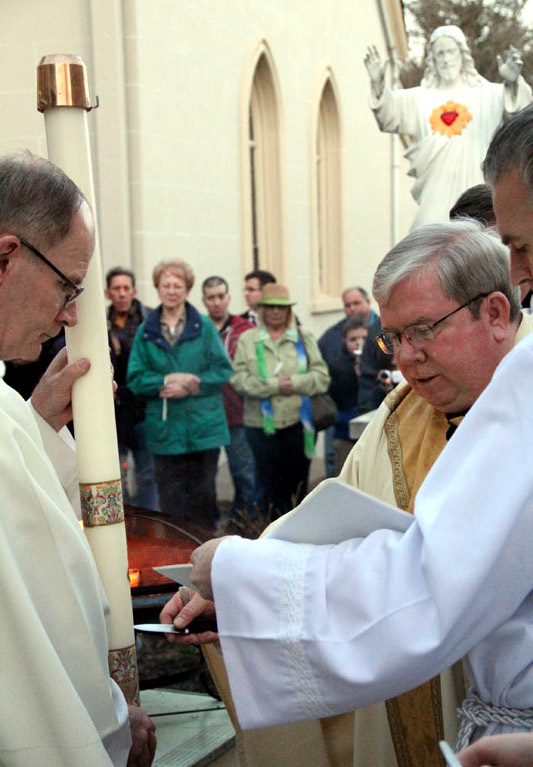 Deacon Farrell holds the candle as Father James Lyons lights it at dusk in the courtyard beside the church. 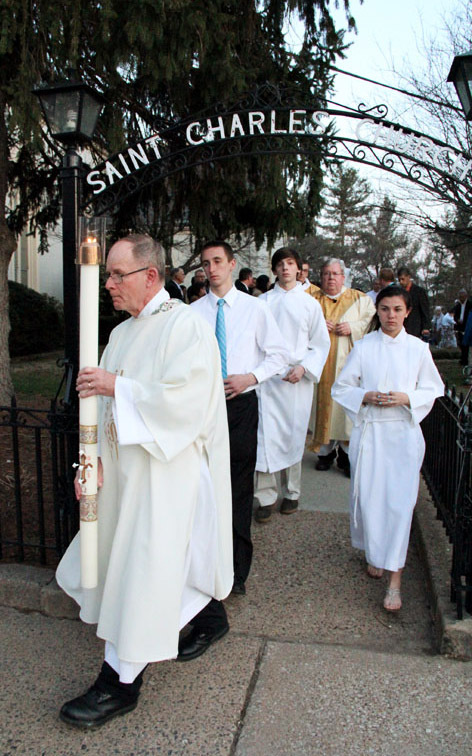 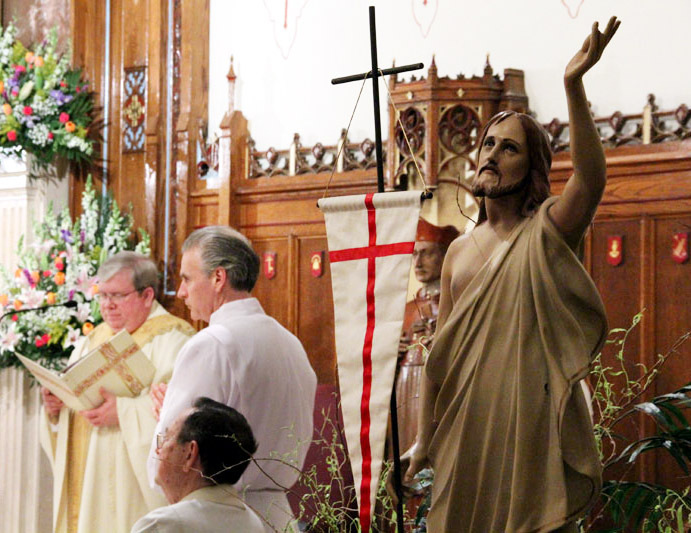 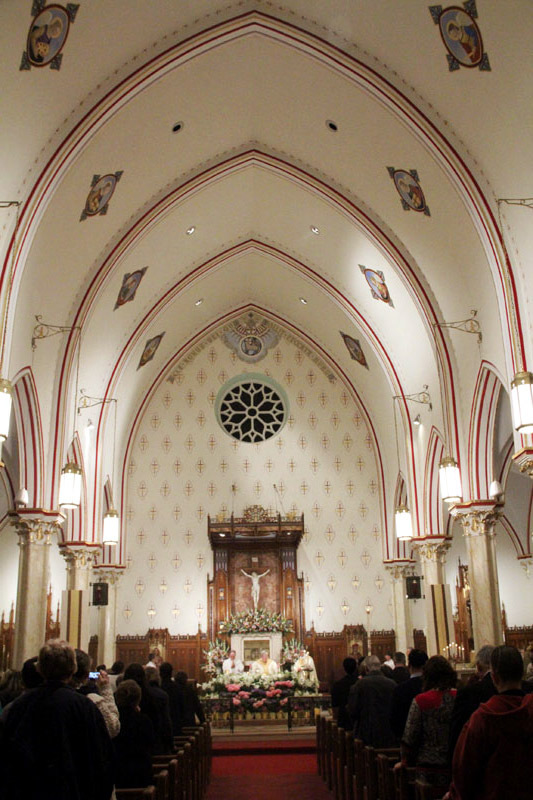 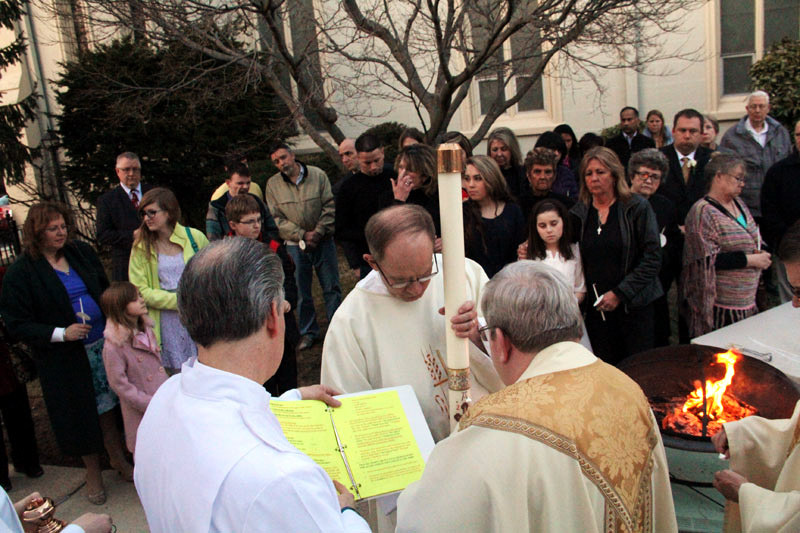 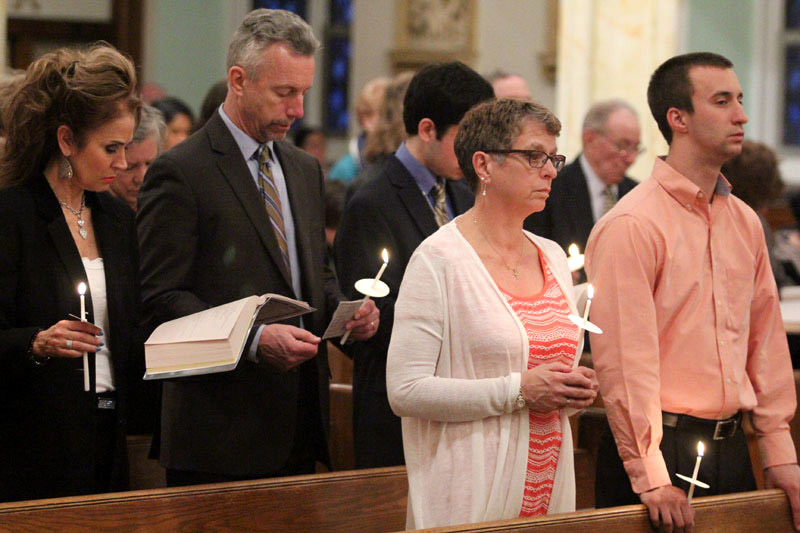 Parishioners process into church solemnly with the newly lighted paschal candle, symbolizing the light of Christ conquering darkness, and death itself, by his resurrection from the dead. 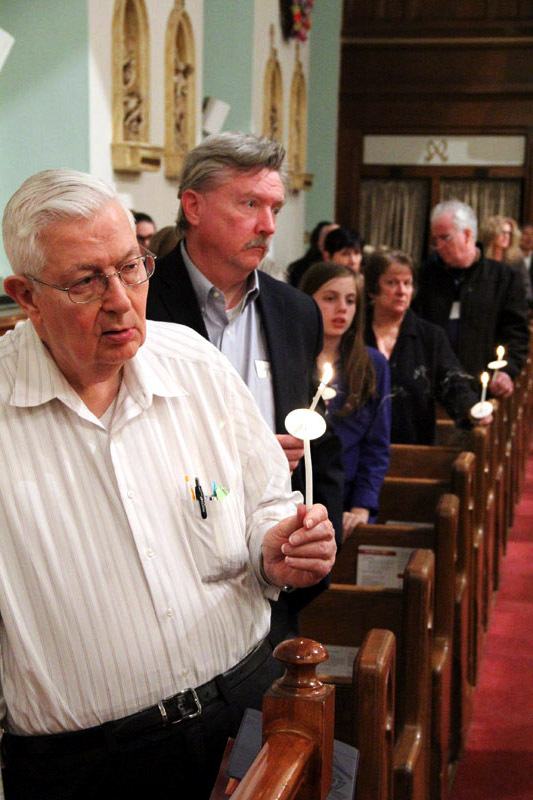 Parishioners light their candles from the flame of the paschal candle as it is brought into the church. 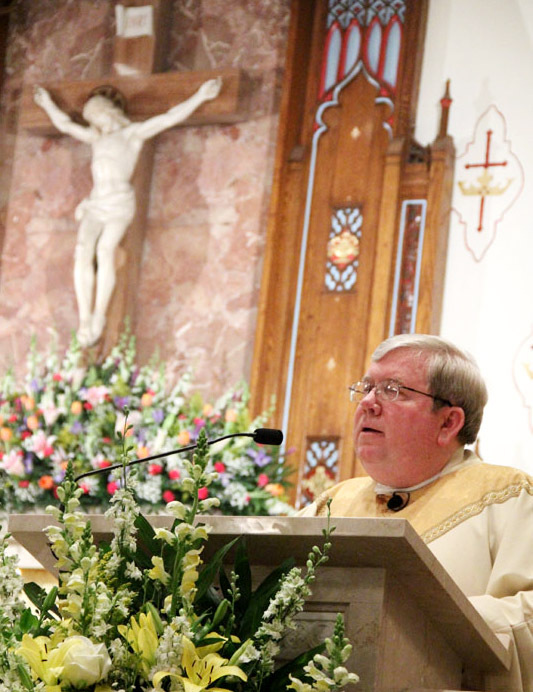 Father Lyons preaches the homily. 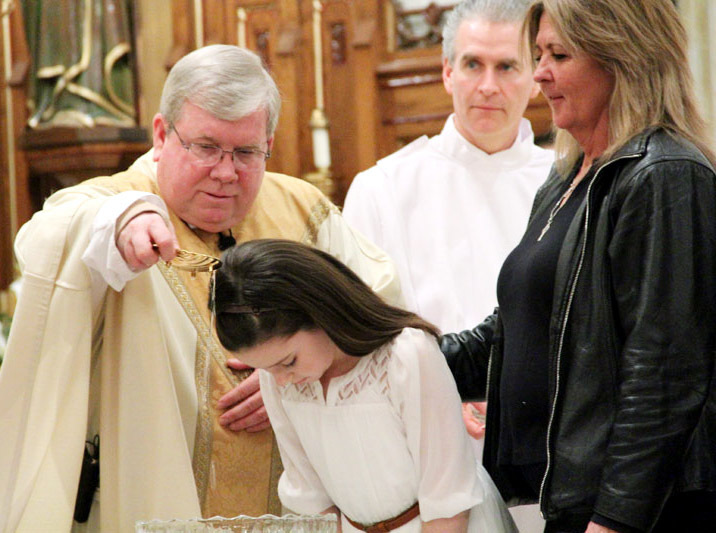 Father Lyons baptizes Julianna Devlin with her sponsor Kathleen Smyth by her side. 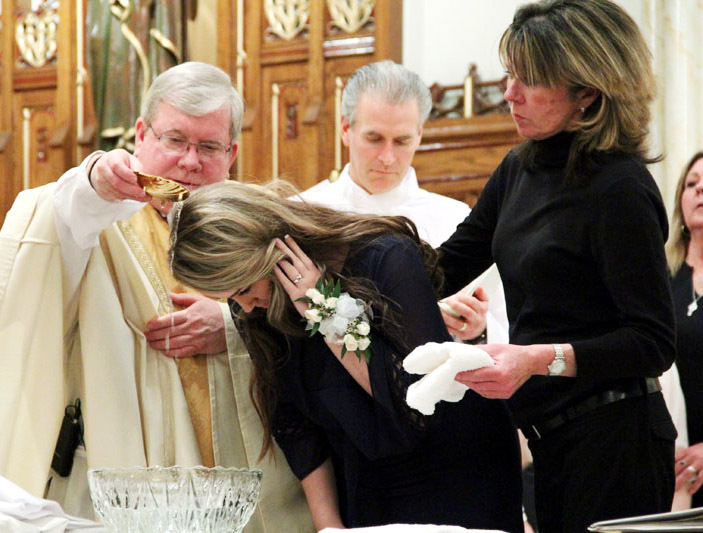 Father Lyons baptizes Alexis Devlin with her sponsor Doreen Smyth by her side. 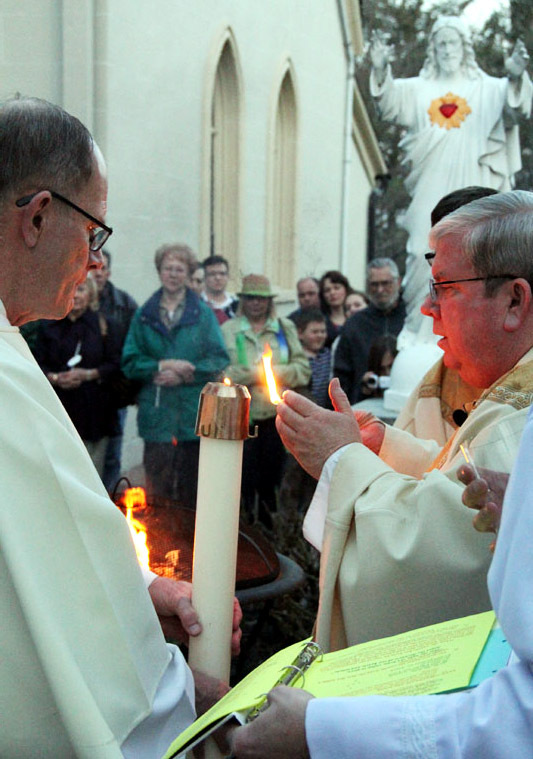 Father Lyons baptizes Jared Zangwill. 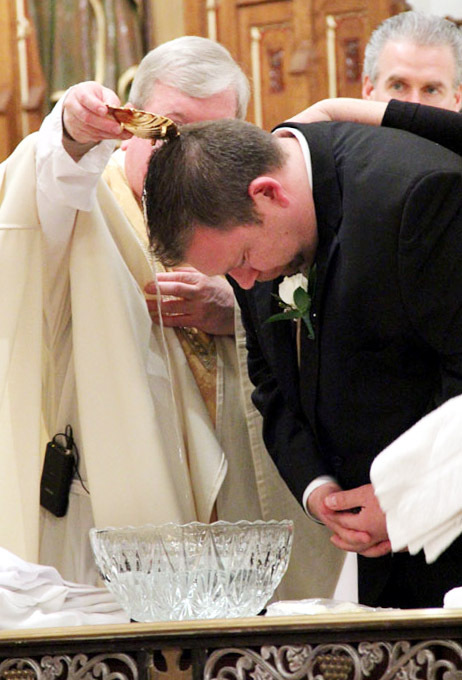 Father Lyons sprinkles the people with holy water after the renewal of the baptismal promises. 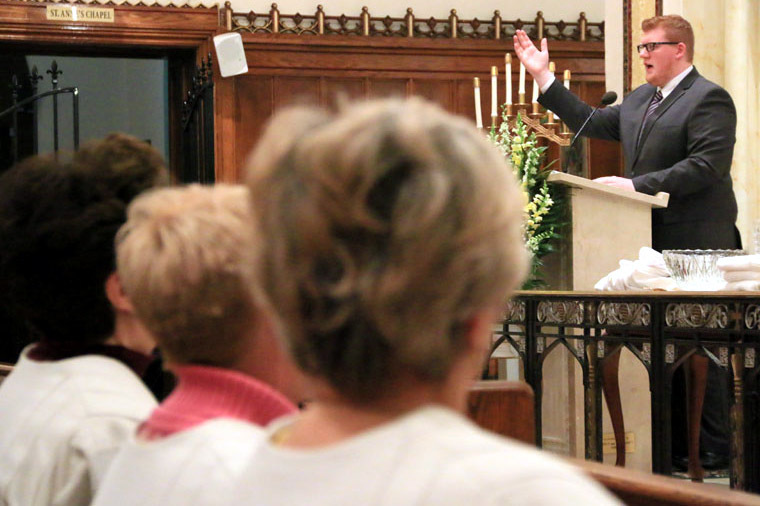 Deacon John Farrell sprinkles the congregation.